We have been shortlisted as one of the top ten startups to watch out for in 2013 by Startup Village. This came in as a total surprise. It felt really good to be acknowledged for what we have done so far. As a startup, acknowledgment, and appreciation rarely come your way, so this was a welcome change. The fact that the award was presented by Kris Gopalakrishnan, Co-Chairman of Infosys and Chief Mentor Startup Village made it more rewarding. Sijo Kuruvilla (CEO, Startup Village) and Sanjeev Vijaykumar (Chairman Startup Village and CEO of MobME Wireless) were also present amongst other dignitaries. 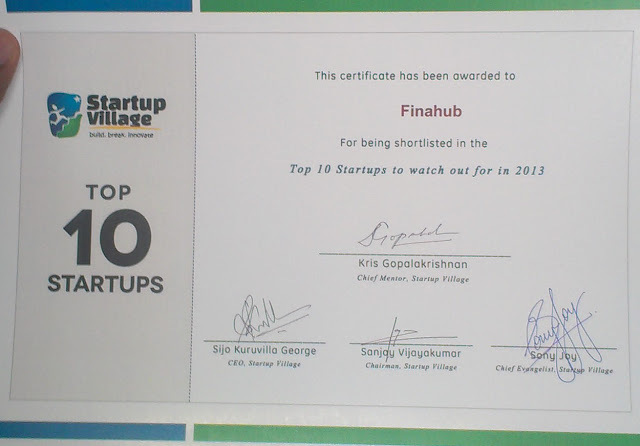 The award was presented to us last Friday, 28th Dec 2012 at Startup Village by Kris Gopalakrishnan in a ceremony held at Startup Village, Kochi. The award ceremony was attended by the members of other startups and there was a good number of media folks covering the event. Given below is snap of our Cheif Geek, Ajith George receiving the award. We thank the Sijo Kuruvila and the team at Startup Village for putting us up in the list of those cool startups. This award is a great encouragement to put in more sleepless nights, to improve our product, meet with more prospects and come up with solutions that will help us serve our customers better. We would also like to thank our customers for their support and faith in us, without which we would not have come this far. Last but not the least we would like to thank the team at Startup Village for arranging the event and making it a grand success, you guys rock.